While I'm working on the assignment for weeks 5 and 6 of the MOOC, let's have a look back at week 2. We were asked to provide a critique of a graph about the words used by speakers at the Republican and Democratic conventions for the 2012 election. As with most of what the New York Times graphic department produces, it is outstanding although this one is more playful than usual, which might be why Cairo asked us to review it. Edward Tufte recommends to steal a good design instead of inventing an inferior one so for my attempt I have copied the slopegraph from the cover of The Functional Art, the book of our professor, Alberto Cairo. Bar charts seemed the natural solution, but I wanted to go beyond my comfort zone and see whether some insights could be gained by a more unusual display of the information. It took me around four hours to produce the following in InDesign. I had observed in the data that the word Obama was an outlier, something not so obvious on the NYT graph and I wanted to make it stand out. I cut out the top of the Republican axis on purpose to highlight the discrepancy. As for the wording, I used "frequency" several times because it seemed to be missing from the original and others than me thought that the numbers represented were absolute. The infographic provides a few story headlines on the left. When clicked, they expand to show a short analysis and the graph adapts to highlight the relevant information. The picture below shows the result when a user clicks on "Political brand value". Click on the image for a larger version where the text is visible. In the paragraph examples, I do not highlight the selected word on purpose, avoiding the temptation for the reader to start in the middle of a paragraph. There are several problems with this graph and it is certainly not better than the original. The display of speech excerpts is now constrained by the design, the words at the bottom are bunched, and in certain cases I had to be careful to avoid unfortunate associations such as "bin laden, Democrat" or "China, Job creators". Most importantly, I'm no longer sure a slopegraph is an accurate tool to represent this data. In a discussion on Forbes about the graph makeover contest, Joe Mako proposed a slopegraph that just doesn't seem right to me. Like another commenter, I see a continuum between the two sides. In my previous post, I blamed it on the sparse data, but I wasn't convinced. Joe kindly provided references about slopegraphs and they shed some light on the issue. Charlie Park quotes Edward Tufte: "Slopegraphs compare changes over time for a list of nouns located on an ordinal or interval scale.” Then again, Cairo's own graph is not a time series and it works. Why? I think because it is a multivariate analysis. The Wikipedia entry for parallel coordinates (slopegraph-looking) suggests that they are meant for such purpose, like scatter plots. This graph is not a multivariate analysis nor a time series. Was it wrong to even use a slopegraph? 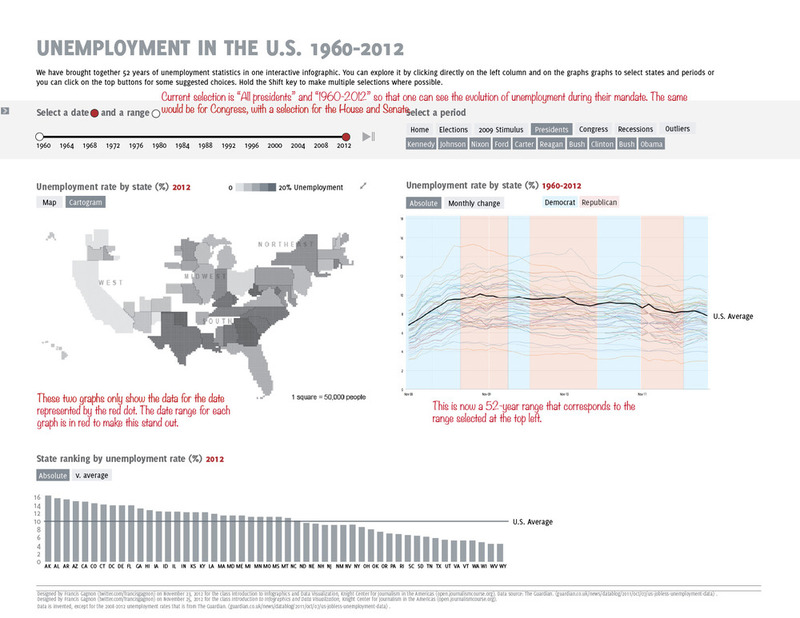 US unemployment data has been visualized over and over and over in the last year because of the election and recession. 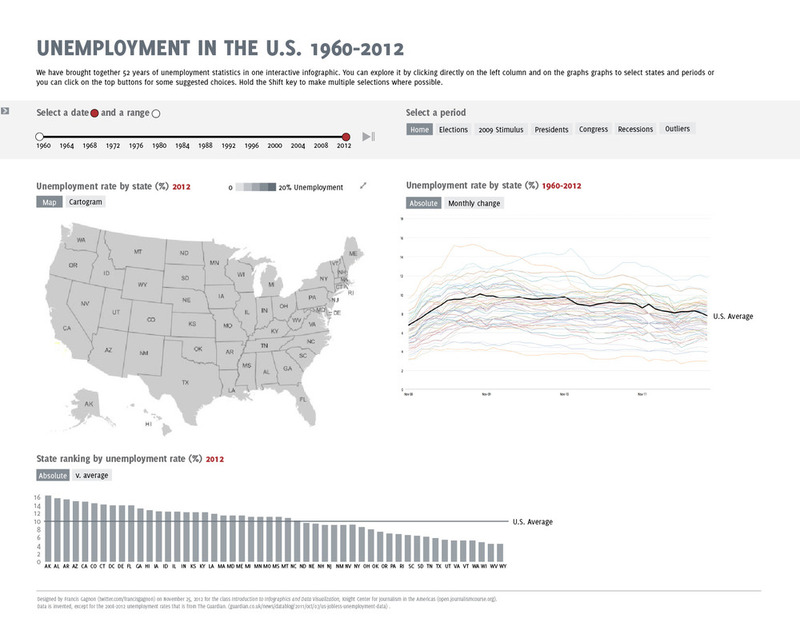 Not only is the topic important but the US Bureau of Labor makes the data easily available. It was not surprising that Alberto Cairo chose it for our week 4 exercise of the MOOC, but it also meant that the bar was already set high. 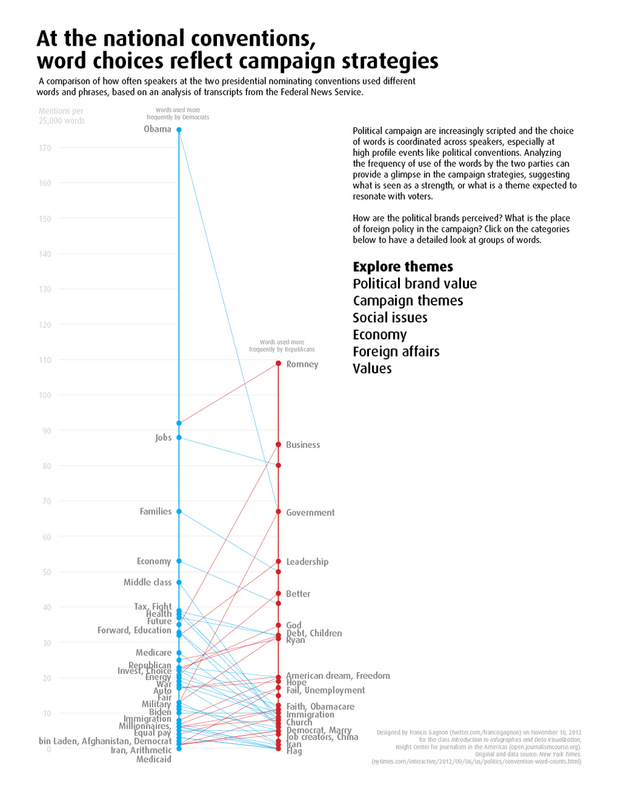 The data set, coming through the Guardian Data Blog, was comprehensive if not diversified. My experience in the prior weeks led me to conclude that I should not spend too much time exploring the data and focus on executing a neat infographic. This turned out to be the wrong conclusion. After a quick survey, the data seemed to lack in depth: providing four years of unemployment data immediately begs the question of what happened before those four years, especially since an economic meltdown had happened in the months prior. So I decided that my interactive graph would show 52 years of data (and it is available). I envisioned a basic visualization with multiple graphs that would allow the user to explore all the data and cut it in multiple ways - by state and by date. Here's how it looks. I chose a grey color theme to keep the focus on the data-related colors, but it seems a bit dull although it might not be the colors as much as the fonts and design. Data linked to population call for a cartogram because it is not based on the territory, contrarily to weather, agriculture and climate for instance. It seemed also natural to offer the option of comparing any set of states so I took my inspiration from the Google Data Explorer. The states are hidden in a drawer on the right and I'm not quite sure that the users would notice this. The closest I came from providing a narrative is in creating ready-made periods, on the top right. In the example below, the user has selected the results of the 2012 election and the lines, bars and states are colored according to each party. I'm not sure how it would really work on the map since I would end up with two color shading, making hard to compare levels of unemployment across parties. It seemed interesting to see the influence of the political system on the economic performance. It is unclear if presidents or even Congress can have an impact in the short run, but it is something that partisans constantly bring up. I thought that the users would like to know what happened while their party was in power. Two variations in the next version. The most obvious is the circles representing jobs created and lost in each state. While circles are not very precise, I find it an interesting way to show four data points at once: losses, gains, differential and overall size. Also, it is unusual and eye-catching. Some users might need a minute to understand it, but it pays off. The second variation is in the bottom graph where the data is now relative to the average national rate. It is less radically different than I expected. In fact, I'm not quite sure that it adds enough insight to justify the interactivity. I went heavy on the interactivity and customization but I mostly missed the story. I did not look for hence I did not find one. My graph comes across as a source of raw data for people who are interested in economic data, but it does not draw in anyone new. Yet another lesson learned from this MOOC. The third week's assignment was right up my alley: aid transparency. It is even more disappointing then that I was not able to complete something worthy. The source data comes from the Transparency Index of Publish What You Fund and takes the form of a ranking of aid agencies according to their transparency score. I expected the students to visualize this ranking, making more apparent the comparison between agencies, highlighting their strengths and weaknesses. I decided to try something different by visualizing the indicators themselves. I thought that it could be a nice way of explaining data transparency by detailing how it is measured. Here is my entry. The assignment was for an interactive visualization, so the image below shows some of the interactivity that could be prompted by the users, namely a series of definitions and the capacity to select a subset of indicators. Using Adobe InDesign, means drawing every data point and this took way longer than it should, mainly because it does not add so much to the graph to have very precise data. Most people just give a quick look and are mostly interested in the ways in which the data is visualized, more than the result of the visualization. This point was driven home by the multiple hand drawn sketches of fellow students that did not approach accuracy, but that sometimes conveyed clearly enough their concept. The next week, I wouldn't be caught. Given the call for a narrative, I spent some time finding and writing some analysis. Again, this is not something that I expect anyone to read -- at least, no one has ever commented on the text -- so it does not seem like a good investment of time. In general, I like to use colors to visually group things, but more than once my audience has been more interested to see things grouped by subcategories, so that's what I have done here with the three categories of transparency. See how the colors are grouped. I have to say that it worked better than I had anticipated. This slide shows only the improvement of each indicator. The main message is that all indicators have improved over the last year, although some much more than others. In the end, I did not get to produce something of the quality I was hoping for. I picked my colors at random, I did not include a legend, I did not push the analysis, etc. But the week was over and another assignment was waiting. The point is not so much to create a perfect infographic, but to learn and this goal was already achieved. When I first heard of the massive online open course on data visualization at the Knight Center of the University of Texas, it seemed the term had been invented for this class. I realized I was wrong when I saw the article in the New York Times: The Year of the MOOC and the Washington Post: Elite Education for the Masses. I wasn't so far off though since 2012 appears to really be the year of the MOOC. 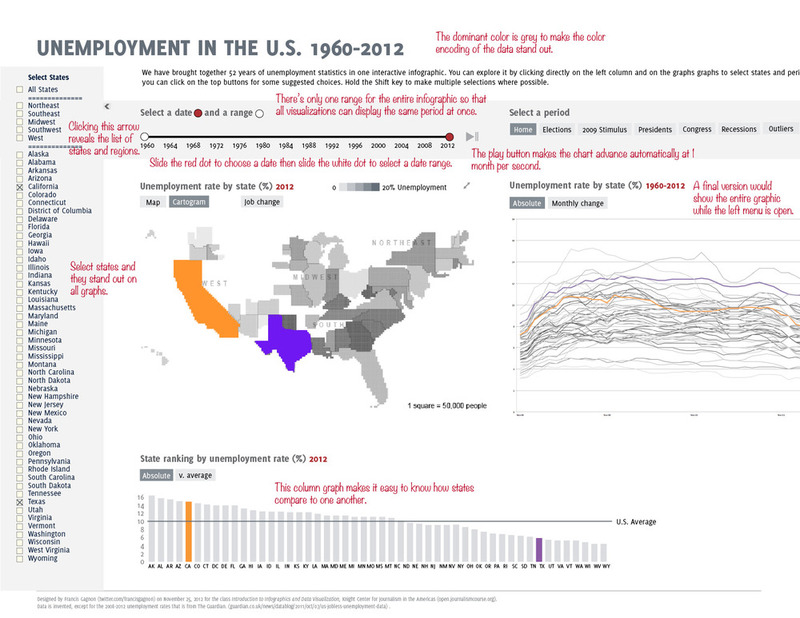 But it's not for the thrill of taking part in the early days of a potential revolution in education that I took this class, but to learn about data visualization. I had already taken the one-day course of Edward Tufte and the two-day class with Hanspeter Pfister at the Harvard Extension School. And I had even submitted an entry to the dashboard competition of Stephen Few (I did not win and had to trash an excellent acceptance speech after three weeks of wordsmith). I was ripe for this MOOC. I tend to follow a lot of links about data visualization but what caught my eye with this one is the name of Alberto Cairo. He first came to my attention just a few days before when Stephen Few announced on his blog the publication of Cairo's book, The Functional Art, and said "If graphic designer Nigel Holmes and data visualizer Edward Tufte had a child, his name would be Alberto Cairo". I didn't remember Nigel Holmes' name, but he had me at "Edward Tufte". Registration was free and I needed both the skills and the signal so I enlisted immediately. The fact that it was only six weeks also played a part. Its been four weeks already and I haven't regretted it. Alberto Cairo brings a perspective that I had not seen anywhere else: the importance of the narrative. My training had been focused on the technical aspects of data visualization: what conveys the data most clearly and efficiently. With his journalistic background, Cairo is always looking for a story in the data. His persistence is impressive. So it has taken me down a brand new road and so far, I've enjoyed the landscape quite a bit. I'm especially impressed at how engaged he is in the discussion forums. Despite having 2000 registrations (I would guess 200 active students though), he comments on what appears to be a majority of the entries. This class and the professor gave me the impetus to start this blog. Cairo apparently links to all the students' homeworks he can find and seeing everyone else made me realize that I should establish my own online presence beyond Twitter. I see it first as a place to learn, to test myself and to create links with other in this field. The hardest part, so far, was to find a domain available and I went for infodez, the equivalent for information design to what dataviz is to data visualization. I am interested in several aspects of information design, from newspaper design to government forms, so I thought it might fit better.